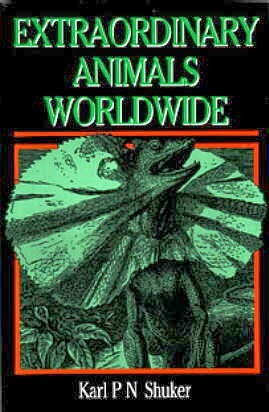 Extraordinary Animals Worldwide (Robert Hale: London, 1991; ISBN 0-7090-4421-6). With a foreword by Janet and Colin Bord. Hb, 208 pp, b/w pics, refs, index. Scientific analysis is brought to bear on these true tales of mysterious birds, beasts and fish. Dr. Karl P. N. Shuker investigates a fascinating assortment of little-known and bizarre creatures, illustrating his account with rare illustrations from his personal collection. Painstakingly gathering his material from a vast array of sources - ranging widely from modern-day scientific papers and news reports to ancient legends and folklore, obscure forgotten journals, and foreign-language accounts not previously made available in English - the author has unearthed absorbing details of the appearance, behaviour and habitat of numerous creatures that continue to perplex the zoological community. They include such remarkable fauna as the singing dog of New Guinea and miaowing snake of Borneo, lightning birds and devil pigs, flying jackals and serpent kings, blue rhinoceroses, electric platypuses, horse-eating terror birds taller than ostriches, earth-shuddering dinosaurs, a terrible mouse the size of a fox terrier, cobras that crow like cockerels, birds with two beaks, and others with four wings - just some of the truly extraordinary animals brought together from around the world. Beautiful antiquarian prints appear throughout the text, faithfully recording these 'monsters' of the natural world - real creatures that offer daunting challenges to the orthodox scientist in search of satisfactory explanations. "We are never keen to admit our dependence on the natural world, but we are a part of it and the sooner we come to terms with that fact and begin to treat nature sympathetically, the better it will be for everyone. We can begin by reawakening our awareness of the myriad life-forms with which we share the planet, and there is no better guide to the extraordinary manifestations of nature than Dr Shuker. His forays into the backwaters of zoology have resulted in this collection of case-studies which will fascinate even the most experienced student of the natural world, and will cause us all to look at the world around us with a new sense of wonder." Janet and Colin Bord, quoted from their foreword to this book. "An engaging modern bestiary, chronicling a variety of forms of beast - imaginary, real and somewhere in between." The Observer (London), 8 July 1991. "Compiled by cryptozoologist Karl Shuker, an author with an enthusiasm for delving into obscure literary and scientific journals in search of the unusual; and the unusual he has certainly found... an entertaining read packed with fascinating information." Michael Bright, New Scientist , 31 August 1991. "A handsome and interesting collection of accounts of zoological oddities of all kinds... Each of the creatures is discussed with admirable scientific precision. The scope and depth of Shuker's research is impressive, and covers a wide range of books and articles." Ron Rosenblatt, Strange Magazine , November 1991. "[A] fascinating pot-pourri of mythology, cryptozoology, and genuine natural history... The strength of this lively book lies in the intelligent assessment and explanation of the various mysteries propounded." Professor John L. Cloudsley-Thompson, The Biologist , November 1991. "Karl's sure grasp of his subject, and his thorough research, gather and retell fascinating facts and stories about a type of animal and the interesting or folkloric variations of it... It is easy to read, useful enough to become a valued reference, and surprisingly entertaining. What more could one ask from a non-fiction work?" Bob Rickard, Fortean Times , December 1991. A work of great interest to anyone curious about little-known mysteries and anomalies of the animal kingdom... Even readers knowledgeable about the animal kingdom will be amazed by how much material is unearthed on creaures ignored by mainstream wildlife books... Extraordinary Animals Worldwide is highly recommended, and I eagerly await Dr. Shuker's next work." Mark Chorvinsky, Fate , November 1992.